Unlike all those years you spent at Boy Scout camp, no group push-ups, map making or log carving will be required for you to feel the love at this special campfire celebration at The Yard in Brooklyn. All you’ll be asked to do is sit back and enjoy a full set by José González. We’re also giving you hilarious tales of summers gone by performed by members of the Upright Citizens Brigade. Campfires never looked this good. 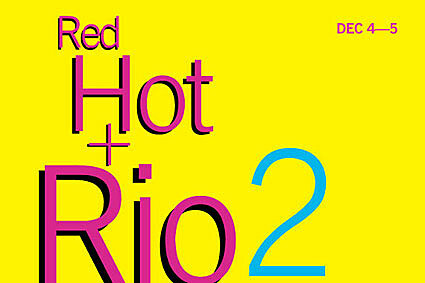 An all-star benefit tribute to the music and culture of Brazil, Red Hot + Rio 2 salutes Samba Soul, the post-tropicália movement of the 70s that merged elements of North American soul music with Brazilian rhythms. Mixing samba with R&B, soul with baião, pioneering artists like Jorge Ben Jor and Tim Maia signaled a cultural awakening that changed the direction of Brazilian music forever. The concerts at BAM bring together the newest generation of Brazilian and international artists who represent the legacy of this influential musical style. Music Directors Kassin & Mario Caldato, Jr.
A portion of the proceeds will benefit BrazilFoundation’s AIDS-related projects.